Note : (a) The pension Sanctioning Authorities should ensure that the date of birth and the age of a pensioner/family pensioner, are invariably indicated in the pension Payment Order to facilitate payment of additional pension by the pension Disbursing Agencies as soon as it becomes due. Dearness relief shall also be admissible on the additional pension available to old pensioners/family pensioners. 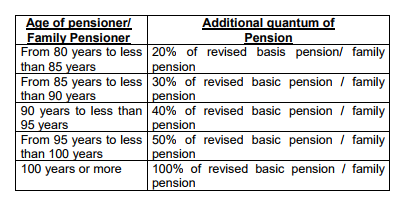 (b) The additional pension payable to old pensioners/family pensioners of 80 years of age and above shall also be applicable to old pensioners / family pensioners of 80 years of age and above in receipt of Disability/ War Injury Element/ Liberalized Disability Element of Disability/ Liberalized Disability/ War Injury Pension also. Auth : GoI, MoD (DESW) letter No 17(02)/2016-D(Pen/Pol) dated 04 Sep 2017.